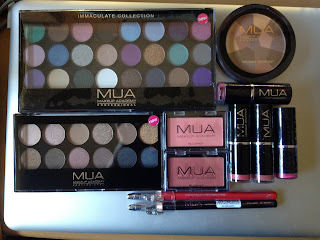 The Shopping Queen: MUA Haul! I placed an order with MUA 2 weeks ago and my order finally arrived today :) The order only cost me $38 all up including shipping which was about $12. I got everything here for pretty much the cost of a MAC lipstick! The only downside of the order was that while they wrapped the palettes, blushes and bronzer really well, they didn't wrap the lipsticks or pencils. I think they should have bubble wrapped the pencils a little bit as they have a tendency to break if they're dropped or tossed around in the post. I picked up the 12 pan undressed palette (bottom left hand corner) as the heaven and earth was out of stock. I really love this even though I'm normally not an eyeshadow person! I'll be doing reviews on it shortly. I also picked up 2 blushes in shades 1 and 4. I would've gotten a couple more as they were super cheap but I already have too many blushes! I also got 4 lipsticks in shades 2, 3, 6 and 11. I wish these had names! I went by swatches that I found on other blogs so I'll definitely be contributing my own swatches soon. I ran out of time to do any while the sun was still up. On the top right hand side corner is the mosaic bronzer in shade 1 (natural glow). I'm not a fan of shimmery bronzers but this only has a tiny amount of shimmer. Lastly is the 24 pan immaculate eyeshadow palette. This was included with the order for free. I don't wear bright shadows so I decided to do a giveaway with it. 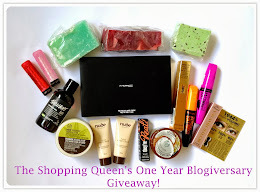 There's less than 2 days left to enter the giveaway if you haven't already! I really want to try this brand, I sometimes fill my cart up with stuff on their site but never end up purchasing products the shadows look really great and I can't wait to read your reviews on them! I didn't realise MUA shipped to Australia. Look's like you got some great bargains. I can't wait to make another order :) I was going to give the undressed palette away but I fell in love with it! That's such a great deall! Can't to read more about the products in swatches. Hey thanks for reading my blog :) I'll definitely check yours out. Awesome haul :) I think once I'm off my spending ban I might do an order from these guys and sleek! Nice palates. So much for such a little price. I'm always so nervous ordering blush and eye shadow online. I fear they will become a smashed mess. Lurve your MUA haul!! I think I need to make an order through the site sometime soon! How gorgeous are those huge palettes!! I love your blog! I'll definitely be checking it out more often. Great haul! I have that blusher (#4) and the heaven and earth palette and love them both! This is so cool that MUA ship to Australia! I was going to get the Undressed palette (or whatever the dupe for the Naked Palette by Urban Decay is) but now I've got the Naked Palette I probably don't need this haha. The colours are quite similar aren't they? I wasn't an eyeshadow person either, but then I started working full time and properly discovered Mac eyeshadows and the Naked Palette! Now I find it so much fun to eyeshadow my eyes! I believe the undressed palette is a dupe of the Naked Palette but I'm not a big eyeshadow wearer so I didn't want to spend a lot of money. I'm definitely going to do a review on them soon :) I have so much stuff to reveiw, I don't know where to start!